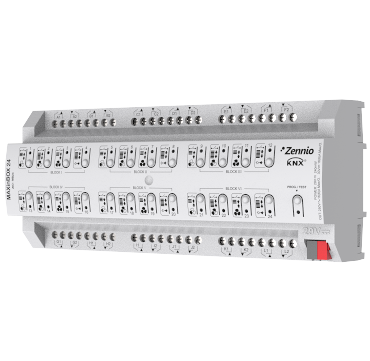 KNX Multifunction actuator for DIN rails (12 units) that offers multiple configurations of up to 12 shutter channels, up to 24 independent outputs of 16A (capacitive loads supported) and up to 6 blocks of 2-pipes fan coil controller. It allows manual control of its outputs thanks to the push buttons on the cover. LED indicators can show the status of its outputs. It includes 30 independent logical functions to enlarge the versatility of the automations in KNX system. Accessories: AC/DC shutter adapters.